SEOUL (Reuters) -- Hyundai Motor Co. expects car demand in Europe to shrink in the second half as government incentives for new cars are phased out. Hyundai expects to maintain strong growth with new models and is likely to exceed its business targets, executive vice president Lee Won-hee told investors on Thursday. But the group, which includes affiliate Kia Motors Corp., may face a tougher road ahead in the second half on worries over the strength of the U.S. and European economies as well as rising raw material costs. Hyundai's European sales grew by 10.2 percent to 191,338 units in the first six months compared with last year, boosting the brand's market share to 2.6 percent from 2.3 percent, according to industry association ACEA. Kia's sales rose 12.9 percent to 138,357, increasing its market share to 1.8 percent from 1.6 percent. Hyundai sees sales growth in China slowing down slightly in the second half, although it would still be strong. The Korean automaker said its quarterly net profit rose 71 percent to a record high, beating estimates on healthy demand in the United States and China. "We aim to reduce costs and increase market share with new product launches in the second half to fight uncertainties stemming from the potential global economic slowdown," Hyundai said in a statement. China, which surpassed the United States to become the world's top auto market last year, could see an easing economy due to expected monetary tightening later in this year. In the second quarter, Hyundai's volume sales to China rose 17.4 percent from a year earlier, while domestic volume sales fell 17.5 percent during the same period, the company said. Hyundai's U.S. volume sales during the April-June jumped 32.6 percent from a year earlier and its market share rose to a record 5.2 percent in June, despite sharply reduced incentives given to customers in the country. New models, such as a revamped version of its best-selling Elantra compact, will help Hyundai recapture domestic customers from its competitors, analysts said. 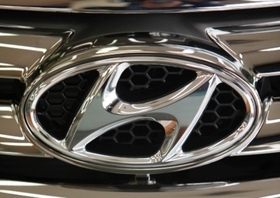 Hyundai reported a record net profit of 1.39 trillion won ($1.17 billion) in the second quarter, compared with a consensus estimate of 1.1 trillion won by 23 analysts on Thomson Reuters. That compared with a 811.9 billion won profit a year earlier and the previous record of 1.13 trillion won in the first quarter of 2010. Quarterly operating profit stood at 863.3 billion won, above a forecast of 801.3 billion won profit. Since the beginning of the year, shares of Hyundai have risen about 20 percent, versus a 5 percent gain in the wider market.